No Fenders -Formula 1, IndyCar and A Whole lot more..: Bernard & Co get a little Dirty! You see – Danny was taking part in a “One-off” Radio contest to ride aboard a specially modified two-seater Dirt Car Thursday morning, with none less than Sprint Car legend Jack Hewitt behind the keyboard! As I’m not a fan of Dirt racin’ or Ovals - hence, this is a world I know very little about, albeit apparently with ‘R’s coaxing, Mr. Bernard is trying to recapture Indy’s linkage with the USAC’ers and their Sprint Car devotees, i.e. ; the Good ‘Ol Dazes when many of Indy’s Big Names came up thru the USAC Midget ranks. 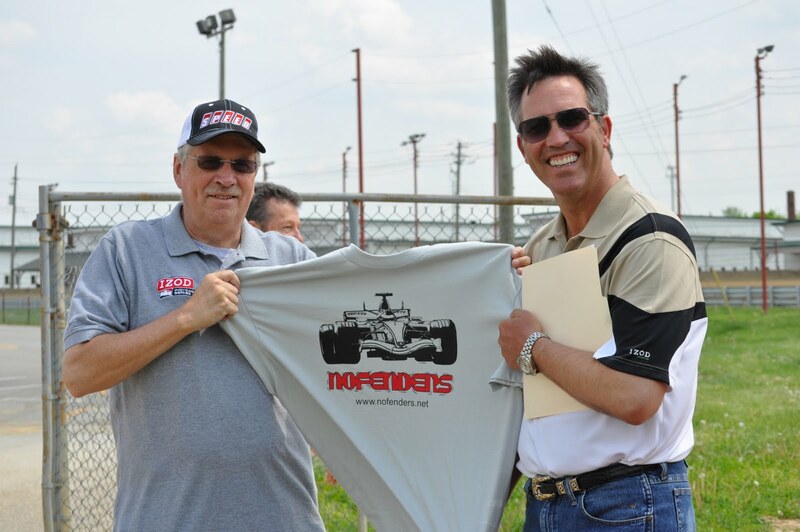 Then there was a very clever Photo Op session (besides the Miller-Bernard No Fenders T-shirt) consisting of Clauson driving the two-seater, Schrader in a late model Modified and Scheckter in thee Indy Racing Experience’s 2X-seater, which I didn’t think could run on dirt? As I wouldn’t want to be the lucky mechanics that get to clean her up, eh? Thus, if you’re in town for the 500 and are looking for something a little different during the chock O’block Memorial Day weekend, then Y’all might wanna head out to the Indiana State Fairgrounds Friday night May 27th for the Hoosier 100! Scheckter noted how he’d gone for a ride in the two-seater Dirt Car with Jack Hewitt at the wheel and although he’d have enjoyed putting it thru its paces, he had to remain calm, cool & collected – reminding himself that Indy was his primary focus... Although Tomas reflected that the Dirt Modified was good fun with it’s 750bhp on tap.